This box can be used with a P300 based paradigm to have a simple game. A target card is choose among a collection of cards and it display in the �Target� area. The application shows each card sequentially. After a number of repetitions, the card that the user was focusing on is automatically found. This input is used in order to define the target card the user should focus on. See Doc_BoxAlgorithm_P300IdentificationCardVisualisation_Setting_5 to know what stimulation should be used. 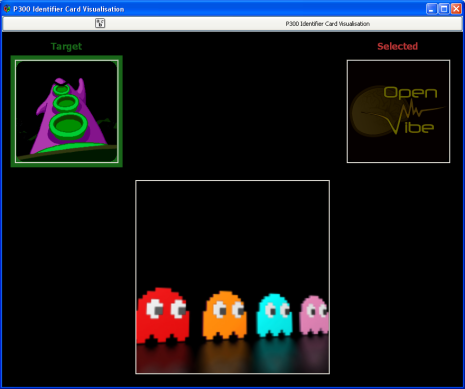 The target card will be displayed in the "Target" area, with a specific color so the user quickly notices it. to know what stimulation should be used. The selected card will be displayed in the "Selected" area, with a specific color so the user quickly notices it. This output is used to translate incoming stimulations depending if they are target or not. The actual target is determined with the second input. As soon as the target is known, each display card can be considered as a target display or not. This can be later use for selecting evoked response potentials against other responses. This box is used in the P300 Identifier card BCI. Please see this scenario in the sample openvibe-scenarios.